This is a guide about Red Hat Society club ideas. Having fun on a regular basis promotes a happy life. This group for women over and now under fifty, support and encourage women to get the most out of life. I am looking for suggestions on what kind of entertainment for red hatters or some kind of trips for red hatters. According to the write ups I read about the group meetings where I live, they go out for meals, sometimes they take a day trip to another town to meet with groups there, or attend a play or for sight seeing. They do a whole variety of things. It would be a good idea to visit with the members to see what they would be interested in doing. You could also tour museums, etc. There isn't anything that these groups do that doesn't cost money. Hi, Our Red Hat group does lots of different things, and really, anything that you can think of that the group would like is good. We have had wine and cheese parties at a group member's house, everyone chipped in for the food with some cash. We like to go for lunch at various restaurants; ones that are a little bit special. We have pot luck suppers quite a bit, often in the local Legion lounge, and then have some sort of entertainment. We have had quizzes about the Olympics. At the March party, we all wrote limericks and we had a lot of Irish jokes read. Jewelery displays and sales (one member's daughter made homemade jewelery). We've gone bowling, gone to fundraisers like lunches for Breast Cancer together. This month we are going to a Hawaiian supper together that is put on by one of our local churches. In the summer, one of the ladies invites the group to overnight at her lake cabin. We have weiner roasts. We invite a Red Hat group from a neighbouring town to come up for an event, and sometimes we go to theirs. Some groups are quite ambitious with regard to trips; if you had gamblers, you could go to a local casino; any kind of show -- music, play, etc. You could tour a museum or art gallery, take in an art opening, go for tea at a tea house and then shop at some specialty store (like Ten Thousand Villages or something). We have gone bowling. We've attended a wine tasting at a local liquor store, and then gone for coffee at the Dairy Queen! Ha ha. We've had a tour of the greenhouses and nurseries in spring, and then gone for tea at a tea house. One group took a tour of a Military Base! We've taken trips on a local houseboat on the river. You could go for a craft class at a craft store and then for tea. One of our members almost always brings jokes off the internet to share. People bring trip photos sometimes. If there is something going on in the community, we often go as a group of Red Hatters rather than just go with one friend. I live in Michigan, I could do a Red Hat Lady cupcake stand. 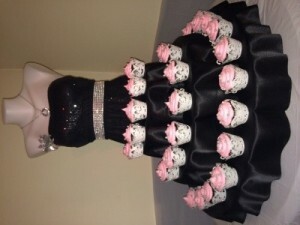 My Facebook page is SweetTreat Displays. Flushing MI. 810-577-5171. Thanks! Hi there, I am an Aussie red Hatter and we meet twice a month and as we have a few in our chapter we arrange for the ladies who are having a birthday in each particular month to put on something different. I have just come back from a pacific island cruise with my children and as my birthday was January I decided to carry the island theme through with my lunch. I arranged to have it at a lovely hotel near home and I decorated the tables with frangipani flowers and leaves, chocolates and macadamia nuts, with an island theme name tag for each of the ladies. Dressing up with flowers in our hair and very colourful dresses. It was a fun day and I know many more to come. Question: Red Hat Society and the Poem "Warning"
I Googled this answer: 'Warning', Britain's most popular post-war poem, according to poll conducted by the BBC in 1996. The second line of this poem inspired the formation of America's Red Hat Society, the largest women's social group in the world (which has over 70,000 members and almost 24,000 chapters in the US and 25 other countries) and encourages fun, friendship, freedom and fulfillment. It explains so much doesn't it?. It's for all of us who had a big shock the first time we heard mother's ( and g.mother's) maxims coming from our own mouths. Yeh, let's shock our kids, embarrass them occasionally. Let's grow old disgracefully - Freedom, here we come! The connection is that our Queen Mother Sue bought a red hat for a friend at a flea market and gave her the hat and a copy of the poem to cheer her up. She continued doing so and before long she had a whole group of friends who would wear purple and their red hats. Now the organisation is worldwide. Any female over the age of 21 can become a member but anyone under 50 must wear lilac and a pink hat until she becomes of age. Bras can be used to make unique sometimes flamboyant hats. 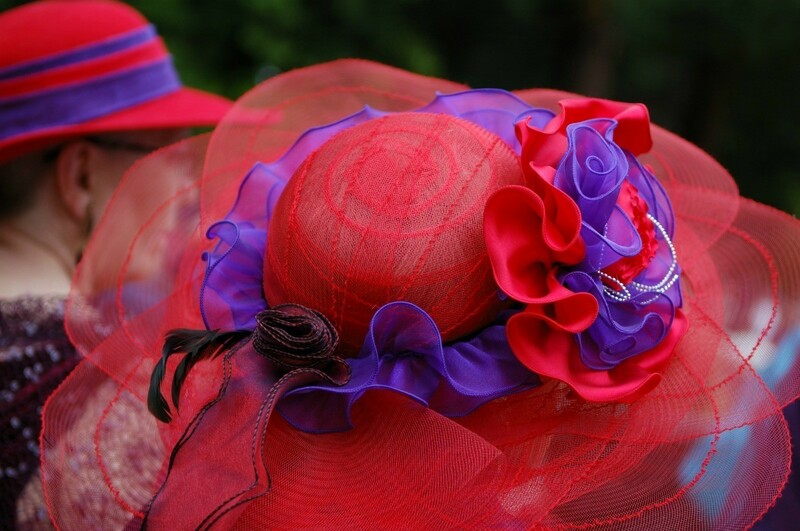 The Red Hat Society is a women's play group that began in 1998 and is now an international women's social organization. Members over 50 wear red hats (often large and elaborately decorated) to group events. This is a guide about making a Red Hat Society bra hat. I have started a "red hat society" group at my mother's nursing home. Can anyone help me with ideas for entertainment to bring in for the monthly meetings or any type of things to do at the meetings? The ladies are 85-95 years old. This age group presents its own challenges -- limited vision, hearing, and mobility, not to mention arthritis. But on the plus side, these ladies will appreciate almost anything you do. Aromatherapy. Get some scraps of cotton fabric, cut in 9 inch circles, and place an herb or spice in the circle and tie up with pretty ribbon. Number them, and make a master sheet of which number is which spice. Pass them around and have each person guess which it is. You can use dill, basil, oregano, cinnamon, ginger --whatever! Recite a favorite poem. Of course, you'll want to have some ladies "planted" who can start the ball rolling. It's surprising how much the ladies will remember. Read a story from Good Old Days or Reminisce Magazine, and talk about the memories it evokes. Old boyfriends! This one was a winner with our group. Start the ball rolling by telling a story about your dating years, then let them take it away. Maybe talk about getting flowers for the first time, and bring a silk rose or small corsage for each lady. Kitchen band. Give the ladies spoons, washboard, kazoos, anything that makes noise. Bring in a keyboard and set it for a nice rhythm, then play along. The ideas you've gotten so far are also good. One thing we learned though - many residents have trouble swallowing, etc. So the activities department of the nursing home will probably want to provide any refreshments. Keep it VERY simple, do the activity slowly, and avoid competition. This is very different from how you might do things in a younger group. Bless you for your kindness to these ladies, and good luck with the group. I worked at a garden centre/nursery. The Red Hat Society came to visit us at Christmas when we had our special displays (the best in town! and the ladies loved it!). Our garden centre always provided free mulled apple cider for the clientele during the holiday season, but for this special trip other beverages and danity Christmas cookies were also served. Check with management if they will do that. An early spring outing would be great to a place like this as the plants are already growing &amp; many blooming. It really lifts your spirits! I congratulate you on a wonderful idea! My grandmother is 85, and still keeps up on fashion and beauty regiments. Check ahead of time for allergies, but think of a beauty makeover, or just a spa day with manicures, pedicures, facials and such. See if a Mary Kay representative will sponsor (without pressuring sales, of course) Having teas or elegant lunches are great, and you don't have to spend much (you can create it there at the home if needed.) They are not called "ladies" for nothing! Maybe you could arrange for a small, local "Red Hat"group to come to the nursing home one day, all wearing their finery, and having a kind of style show. Red Hat groups usually go out to lunch, so maybe you could arrange for a quest group to have tea or even be able to buy and have lunch at the nursing home. I think you should put some of the responsibility for meeting ideas on the member themselves. Having a different one in charge each month for an idea, and then of course you can help carry it out, if help is needed. How about getting members of other ladies families to help. Maybe taking picture of each one and putting an enlarged copy on ther door. My group the Red Hot Tamales ( from Springfield IL )started a Kitchen Band!! We go to nursing homes! They love it! Has anyone else started a Red Hat Society Club for women who are Mentally Challenged in their day program site? I am a new Red Hat Lady this year (turned 50 years old) and looking for Red Hat crafts to make for my Red Hat friends. Ideas for gifts and party favors holidays and birthdays. About a month ago, I asked for some ideas for using in a Red Hat Group with mentally challenged women. Thanks for your ideas. I have started a "red hat society" group at my mother's nursing home. Can anyone help me with ideas for entertainment to bring in for the monthly meetings or any type of things to do at the meetings?